Greetings to all of you on this Labor Day 2010. This week, the Indianapolis News Guild will distribute new signs that we hope you will all hang/showcase/display, on your desks. The sign says “Keep it Local” … and this will kick off our publicity campaign against the Gannett hub concept that threatens to break apart our newsroom. We believe that consolidated hubs are a mistake and that the best way for journalists to serve readers is by having journalism done locally. Similar outreach efforts are being coordinated or are planned this week at the other Gannett properties that have unions including Rochester, St. Louis and Detroit and Sheboygan. Attached is a copy of our flier — locally produced, of course, by one of our expert designers. They’ll match in color and attitude our desk tents and lanyards. We hope all of you will participate with us. A ‘No’ to us: How about ‘No’ to them? 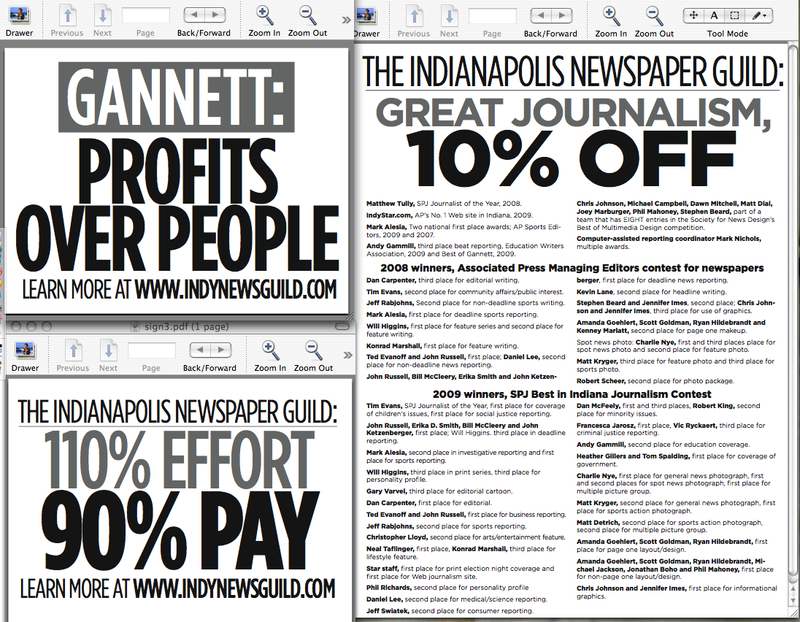 Highlights of this electronic-only edition: Indy News Guild upset over Gannett CEO salary; company rejects request to renegotiate contract to allow for potential of wage increase; we urge all members to resist taking part in any voluntary extra-curricular activity that comes from HR; next Guild meeting is Tuesday March 30. This is meant for Guild members’ eyes only. As unveiled by the Gannett Blog, our parent company paid Chairman and CEO Craig Dubow $4.7 million last year, a sharp increase over the $3.1 million he took home in 2008 … and his 2009 pay included a bonus of $1.5 million that came after he engineered record layoffs and other cost cutting across the company. Other execs got similar bonuses.The Indy News Guild intends to send correspondence to all the directors of Gannett protesting these perks. We strongly believe in capitalism and earning/keeping the fruits of one’s labor – but not earning it by (to borrow an expression) climbing over the bloodied bodies of our employees — and to the ultimate detriment of the company. The executives instead should set this money aside for, among other purposes, to help pay off Gannett debt. Check your Star e-mail (it should have hit your inbox around 1 p.m. Friday) carefully for a 2010 Gannett shareholders’ meeting update that links to the Web site where stockholders can either attend or cast an absentee ‘proxy’ vote for the May 4 meeting. If you own even 1 share of Gannett stock (like through a 401k) you should have received an e-mail correspondence. (The Web site to read the proxy is http://bit.ly/bXLzCy) Unfortunately, the subject line in the e-mail was nondescriptive and coyly worded, and the e-mail may have been easily put to trash or disposed of. It’s worth resurrecting, in Guild officers’ opinions. We read over the 96-page document. Here’s how we recommend you vote on the four proposals, based on the best way to send a message of protest to the board of directors regarding their ’09 bonuses and executive pay. Will your vote make a dent? That’s up to us to decide. Notes: #4 is interesting — a grassroots campaign by a Gannett shareholder that would ban senior executives from receiving any tax “gross-up” payments — which basically perks on a perk. Gannett had to list this proposal in its proxy but urged an ‘AGAINST’ vote. We say vote ‘FOR’ it. In 2009, Indy News Guild members twice made voluntary pay concessions in an effort to help the company through a difficult economic time. Instead of insisting the pay provisions of our existing contract be fulfilled, members twice voted to accept one-week unpaid furloughs without receiving any concessions from the company. Last August, our members also agreed to a contract that included a 10% pay cut and a wage freeze for its term, based on the company’s claim that this was an economic necessity. In response, the Indy News Guild recommends that its members say “no” to any workplace related volunteer HR (i.e. outside-the-newsroom) initiative now through August 2011. The Guild asks its members, for example, to not serve on any Employee Newsletter Task Force or the Engagement Team or any other type of extracurricular activity that is developed that you spot and that you let us know about. That includes skipping the publisher’s meetings. Officers would immediately reconsider this ‘non-involvement stance’ if the company changes its mind about the wage freeze being lifted for all. In addition, members should follow the letter of the contract. This includes not changing work hours with less than one week’s notice. If you are required to work overtime on any day during a work week, you cannot be required to work fewer hours on a different day in that work week to avoid qualifying for overtime. The contract requires one week’s notice to change your work hours. If you are being required to work overtime, you should be paid the overtime rate and not forced to change your work schedule without the required notice. Your schedule and work hours should be posted two weeks in advance. Work the hours you are assigned. If you work additional hours, you should be paid overtime. If you have any problems with a supervisor about this, contact a Guild officer or steward. The Indy Star staff was informed in January that Gannett intends to put a Kronos “fingerprint representation” scanner into use in the coming months to keep track of employees’ work hours. This will replace the time cards employees currently fill out and submit every two weeks. The company says this system cuts the amount of people and time required to keep track of employees’ work time and issue paychecks. The company’s human resources department and Star editor Dennis Ryerson have said it will take about 45 days for employees to get used to the system and then it functions without problems. After several meetings with the company, the Guild formally requested that all reporters, and all newsroom employees, who don’t have a set schedule in the Downtown office, be exempted from being required to use the Kronos system. (Those of you who don’t get OT are already exempted.) We are awaiting their answer. The Guild will object to any scenario in which an employee is subject to discipline or put on a formal Performance Improvement Plan over ‘scanning issues’ where they need to repeatedly have a clerk/editor manually make fixes to the computer system. We feel this system is ill-timed … and the Guild does not support this change, but will strictly monitor it. Is their an upside? Well, the Guild has been assured by human resources the company wants to make sure all employees are paid for all the time they work. If a reporter takes a call from a source or an editor checking facts on a story after clocking out, this time will count toward the 40-hour work week. Just make sure to track every second and keep your supervisor aware of time situations — call Downtown and make a night supervisor aware so that your time is properly credited. The Guild’s position is a fingerprint-image scan system is not the best way to keep track of the work hours for reporters and photographers whose jobs take them away from the newsroom much of the time. We’ve advised them of the headaches and urged them to implement a system that would allow employees to electronically input their hours into a database much like we do for time-off requests, etc. They won’t go for it. The Guild has made no secret of its questioning of the money the company charges employees to park in the Downtown multi-story parking garage, although it is not a situation we have jurisdiction over. Revised payment deductions began March 14 that make the rate $30 per month for daysiders and $16 for nightsiders. The company says the parking rates are reasonable. We are concerned due to the plans by the company to charge employees who park in the uncovered surface area (mainly photographers who make frequent trips off the lot). However, those users are “grandfathered” until August 2011 and won’t have to pay, according to what we have heard from employees, which is good news and will give the Guild time to talk to union members affected by the eventual increase. Congratulations to reporter Ted Evanoff and former features reporter Abe Aamidor, also a former Guild president, who recently had their book “At the Crossroads” published. The book takes a look at the devastation the failing auto industry has done in Central Indiana and elsewhere. Although the company has challenged our grievance related to the July layoffs, there is a provision in the contract related to layoffs that requires the company to give those who were laid off first preference for two years for any new jobs. The contract is not specific on the issue of a guaranteed rehire, and the Guild and the company are working to draft language for a call-back procedure. The Guild and the company are also working on language that will set up a flat differential to be paid to those who for Guild-represented employees who fill in for managers. We hope to have that system in place soon. Officers (five of them) are selected by the News Guild every three years, per bylaws, for three-year, unpaid terms. Your choice to become involved is certainly encouraged, and there are many rewards that come with being an officer — leadership, a chance to assist your coworkers, and the forum to make the workplace a better place to be. All five terms are “up” July 1, and we could really use your help — this is your union. Representation is especially welcome from photographers and building services, in particular. April 1 kicks in the vacation request time-tracking system. All requests for days off have to be OK’d within two weeks of their submission by your manager. And if they aren’t, let us know. Our Next meeting is scheduled for 2-245 p.m. Tuesday, March30 at the Musicians Hall, 325 N. Delaware St., if you want to address concerns, gripe about issues in the newsroom or just get your frustrations off your chest in a safe, collegial environment. We have notified Human Resources that it appears that the company did not correct the health-care deduction (for those who use Star insurance) but any overcharge will be reimbursed on future paychecks. Health care fees are based on your salary and there are four tiers — so if you fell a “tier” then the amount that you are charged gets reduced. We can help you on that too, if you need it. Lastly, we apologize that the contracts have not been printed. Despite verbal promises from HR during the contract signing Sept. 2-3 that 500 copies of the contract would be printed and distributed within a week (the Star has traditionally printed them and bills the Guild for half) that task never got done, but a complaint to HR today got the ball rolling. We will let you know when they are ready, and also make a digital PDF available at all times on indynewsguild.com. Star Publisher Michael Kane and I signed the two-year contract this morning together in the fourth-floor board room, making the deal official. The company and Guild will split the cost of making 500 copies, which will be distributed early next week. The Guild is also putting together a “primer” or guide, so to speak, to address the changes to work conditions. Later, we’ll have a new printed Inkling that outlines our strategies for now through 2011. Also, we’ll be distributing new red triangle-shaped “desk tents” that read “Work the contract” on one side, and “10%: I Gave At The Office” on the other. Michael met with me for nearly an hour as part of the signing. I reiterated to him that the staff is demoralized and divided over the 10% pay cut. I emphasized the Guild’s financial sacrifice. I asked that our unit be spared any additional impact should Gannett seek to get leaner or try and lower payrolls chain-wide now through 2011. And, I requested some type of staff-wide acknowledgment over our contributions — saving the Star $2 million, namely — that he agreed to consider. I didn’t receive all the answers I was hoping for, but he was courteous enough to listen to my questions. Send any thoughts or questions you have to me at indystar68@yahoo.com. Lastly, IndyStar.com online producer Adam Yates, a steward who joined the bargaining committee earlier this year and was appointed secretary on the panel, will serve in that role on an interim basis until our next advertised meeting. He will be appointed to finish a term running through July 1, 2010. Congrats, Adam! Although we have ratified a contract, which will be signed Monday, we are trying to mount an effort to publicize our recent union vote. Toward that end, a handful of Guild members will distribute three handouts on Friday morning to an audience of 600 journalists in town for SPJ at the Westin. An image of the three are attached. We are trying to show Gannett that it might have been able to force this bad contract on us, with its 10% pay cut, but all our members are angry about it — including the journalists who are appearing as speakers at the convention this weekend on behalf of the Indianapolis Star. We are jazzed up about journalism too and want to let everyone know in a positive way the sacrifice made by Guild members. The flyers convey our spirit and resolve — one of the flyers, in fact, lists our numerous winners of coveted journalism prizes — including SPJ’s! — and there’s no better group to tell our story. We hope to provide flyers to Virgil Smith, vice president/talent management, Gannett Company, Inc., who is at the SPJ convention to speak at a career counseling panel. We have chosen to take a big-picture, long-term view of things and recognize that the preparation for the next round of bargaining starts now, not in 2011. Over the next two years, we want to continually remind management here at the Star and at Gannett that we expect a better contract next time. We want management to know that we are expecting to recover the lost pay and lost pay increases in our next contract when the economy improves. We want to remind management we are not happy about only union-represented employees being asked to take huge pay cuts. We need to remind them every day that our members are going to work the contract. P.S. : Some good news: With respect to our inquiry regarding health benefits (in Wednesday’s e-Inkling), we have been told by HR that when an employee has a change in salary that puts them in a different salary band, the change will update automatically with YBR. Once internal paperwork has been submitted reflecting the pay change, a letter is generated by YBR to the employee notifying them of the reduced premium. P.S.S: Some other (possible) good news. Although we did drop the arbitration over the “December 7,” the company has told us that, if and when the Star begins hiring Guild-covered positions again, they will first reach out to those that were let go in 2008. You know why? Because it’s in the contract. The following letter was sent out earlier this afternoon to the publisher, Michael Kane, which we wanted to share with you. The membership of Indianapolis News Guild 34070 voted 56-45 Tuesday to ratify a two-year contract with Gannett, running Aug. 30 through Aug. 29, 2011. The contract includes a 10% pay cut and no wage increases during the term. We want to emphasize that the action by the membership of the Guild is a financial sacrifice meant to help the Star’s bottom line during this economic downturn. It is one of the highest permanent wage cuts of any newspaper in the country. It is a sacrifice that our unit (newsroom/building services) alone is bearing, as management and other non-union personnel have not been asked for the same sweeping, universal cut; our vote will save the company an estimated $2 million in payroll over the next two years. Long-term, we expect the company to be aware of this sacrifice when the economy improves. Short-term, we expect the company to spare this unit should Gannett need to continue to cut costs. As members’ pay is cut 10%, the Guild will accordingly reduce dues by a similar amount. The Guild requests that the company allow unit members enrolled in the company health care plan to have their premiums lowered immediately if their new hourly wage drops them down a level; premiums, as you know, are based on four “tiers” and some Guild members may drop from tier “C” to “B” or from “B” to “A,” for example. It is not only fair, but the right thing to do, in our opinion. The new contract gives you flexibility to assign our team of journalists to work on products that we are not accustomed to working, including the possibility of advertorial. Out of a concern for ethics, we request that you never exercise that damaging option for ANY Guild-covered employees. Finally, now that bargaining is over, the Guild hopes the company will allow Editor Dennis Ryerson to address the aftermath of this new contract with its employees, who are bewildered, upset and depressed over the economic hardship they now face. That hardship was forced on them to fulfill a company mandate that was never satisfactorily explained. They have many questions about why the Indy Star needed to improve its profitability at the expense of only a fifth of its staff. They feel guilty that the company tied an unrelated arbitration to contract talks and that they were forced to “take sides” and sacrifice 7 former co-workers to save their own jobs. 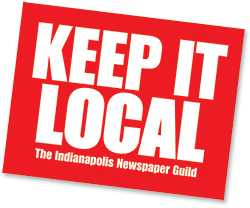 The membership of Indianapolis News Guild 34070 voted 56-45 to ratify a contract with Gannett. Members voted for a 2-year contract that takes effect Aug. 30 through Aug. 29, 2011. The contract includes a 10% pay cut and no wage increases during the term of the contract. The vote today also provides a settlement to 7 Star employees laid off in December 2008. Eighty-six percent of eligible voters cast ballots. The action by the membership of the Guild is a financial sacrifice meant to help the Star’s bottom line during this economic downturn. It is a sacrifice that we alone are bearing, as management and other non-union personnel have not been asked to make this sacrifice. We expect the company to be aware of this sacrifice when the economy improves. We will soon provide the new contract to members, and we urge members to work that contract to the letter. No more free overtime. Thanks everyone for your support over the past nine months.